Some headache conditions are extremely rare and painful. SUNCT is one of them. This syndrome can attack up to 200 times per day with pain frequently reported as a 9 out of 10. In this article, we will be talking about 5 Incredible tools for the SUNCT headaches syndrome. What is SUNCT headache syndrome? SUNCT stands for short-lasting unilateral neuralgiform headache attacks with conjunctival injection and tearing. This is a type of moderate to severe pain in the head, around the eye or temples with single stabs, stab groups or a saw-tooth pattern. Below is a picture describing the pain type. With symptoms often only on one side, it is related to the trigeminal nerve and comes with eye redness and tearing on the affected side. Pain comes on quickly, peaks, generally lasts between 5 seconds and 4 minutes and on average there are 5-6 attacks per hour. It’s a type of trigeminal autonomic cephalalgia(TAC). It most commonly occurs in men after age 50. There is a lack of effective drugs as well as a lack of studies on new drugs, nutritional and lifestyle therapies that are being used on other headache disorders. But we will make some connections and talk about tools you can start using today for pain and inflammation. 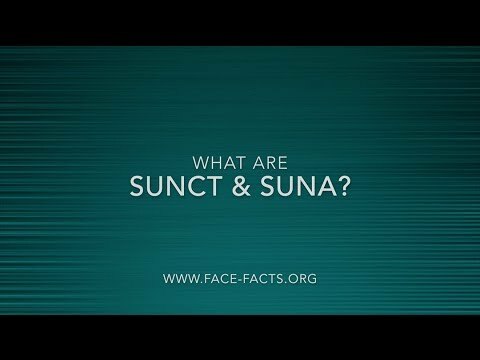 What Are SUNCT and SUNA? There are many different triggers for SUNCT headaches and some of them the same as cluster headaches and migraines like certain lights, scents, and smoke. Even though we want to avoid triggers as much as possible we need to look deeper at the cause or we will continue chasing pain in an endless loop without relief. The causes are largely reported to be unknown because of a lack of agreement on any one area. This is the same for most chronic head pain disorders and especially for the TACs. We need to understand that pain is a protective mechanism by the body used to bring awareness to us. It’s used to signal danger and to force us to stop doing what we are doing that may be causing the pain. The causes of pain are many and can come from any area of life which means we need to look at our body holistically and see a health practitioner that uses mind/body medicine. Assessing our mind and body to find where dysfunction is coming from is a much healthier, more rounded and effective long-term care plan and doing this will give us a multidisciplinary approach we can use to find relief. But these are not always effective and don’t provide a long-term drug-free self-sustainable model of health. We don’t want to just numb pain and reroute it to a different area, we want to address it, learn from it and heal it so that we can get back to our normal lives. If we can address the root cause of what is causing dysfunction in our lives, we can often find relief from the chronic pain that plagues us. Before you start on the healing journey of any chronic head pain disorder it’s important to understand your trigger level and threshold level. Trigger level is the sum total of all the stressors on your body right now. The threshold level is the level of tolerance your body has to its total stress burden. If your trigger level crosses your threshold level, your body is no longer able to maintain normal functioning and goes into what is commonly called a flare state. In this flare state, the body is highly aggravated and the weak area in our body succumbs. If we have chronic head pain like SUNCT then this pain will be triggered. We want to keep our trigger levels down by reducing the total stress coming in from all areas of our life. And we want to keep our threshold level high by supporting our bodies, healing, repairing and detoxifying systems while also providing positive stress that helps build resilience like exercise and cold showers. The foundation principles are the main and most important systems in our bodies functioning that support health. If we have our foundation principles working well, then they are constantly draining our trigger levels because they help our body release stress. Thinking – Understanding when we are caught in stressful thought patterns and how to bring ourselves out of them and release tension. Drinking – Drinking plenty of high quality water(not tap) with bioavailable minerals away from meals to support detoxification and water exchange inside each of our cells. Breathing – Retraining our breath so that we breathe long and deep as well as noticing when stress is creeping up on our lives and causing our breathing to lock up. Eating – Eating whole foods in proportions that are ideal for our bodies stress needs and avoiding sensitive and trigger foods that add to inflammation and immune burden. Moving – Quality movement that helps free up our spine and detoxify our lymphatic system through pumping and opening up tight areas. Sleeping – Getting adequate quality sleep every night so that we can synchronize our circadian rhythms and so that our brain can go through its most important detoxification phase while we sleep. Each of these are very deep topics that the majority of chronic pain sufferers are not taking full advantage of in their healing protocol. To get a deeper understanding of the foundation principles click here. SUNCT is one of the trigeminal autonomic cephalalgias and this means that it’s connected to the trigeminal nerve and related to the functioning of our autonomic(think automatic) nervous system. This means we need to understand that any pressure put on the nervous system can cause a process called nerve dumping where the brain releases extra energy from a dysfunctional system into another nerve. This is commonly done into the jaw, eyes, diaphragm and adductor muscles. But we can’t simply block the transmission and ignore it. The excess of energy is caused by a system having issues that are trying to fix itself. Our brain via the vagus nerve is incredibly smart and actually takes in more information from our organs than it gives out to them in a 9:1 ratio. Then there will be a huge amount of energy going to the brain, if it’s too much, it gets dumped into the trigeminal nerve. This also happens with structural pressure like an atlas vertebrae (C-1) subluxation. Generally, it can happen with C-1 to C-3 and this is why it’s important to see an Osteopath, CHEK practitioner or NUCCA chiropractor ASAP. Read our article on 3 secret ways of understanding trigeminal autonomic cephalalgias here to learn more about this topic. If we are in chronic pain we need support. From all areas of our lives. But using these superfoods may make a huge difference in the quality of our lives, pain, and inflammation. They are very simple and used in the day to day of many cultures around the world but at the right time, dosage and place, they may make a huge difference. See our article on migraine prodrome symptoms and scroll down to number 1 the anti-inflammatory 1-2 punch here and read about turmeric and migraines here. St. John’s Wort has actually been shown in studies to help with neuropathic pain and has been used for centuries for both neuropathic pain and depression. It may be an effective tool but there are interactions with many medications like antidepressants, heart meds, antiepileptics, anticoagulants, HIV medication, and the pill. Always ask your doctor before making any changes to your treatment plan. To understand more about St John’s wort’s effect on neuropathic pain see this article. As you develop your treatment protocol with a holistic health practitioner you will want as much information on the different areas of stress and tension that can be coming into your life and because of this, I encourage you to join the Migraine Professional Community here. To understand more about the trigeminally related head pain disorders read our article on the 3 secret ways of understanding trigeminal autonomic cephalalgias here and learn the 5 profound clues for chronic paroxysmal hemicrania continua here. Have you ever experienced a SUNCT, SUNA or other TAC? Comment below and tell me what your experience was like. Share this post with someone else who may benefit from the information. Mark Canadic is a writer, speaker, holistic health practitioner and migraine community leader. Read Mark’s inspiring comeback story, “My Burnout and Brain Fires that Lead me to the Root.” Feel free to send Mark a message here.